Aug. 21, 2018 — In the future, your car windshield could become a giant camera sensing objects on the road. Or each window in a home could be turned into a security camera. Their innovation was detailed in a research paper, "Computational Imaging Enables a 'See-Through' Lensless Camera," published in the newest issue of Optics Express. A copy of the paper, which was co-authored by University of Utah electrical and computer engineering graduate Ganghun Kim, can be downloaded here. "Why don't we think from the ground up to design cameras that are optimized for machines and not humans. That's my philosophical point," he says. 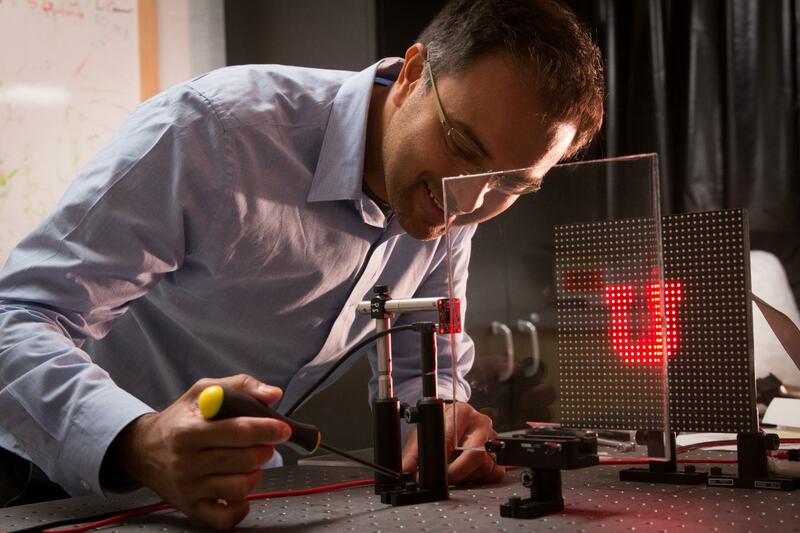 Through a series of experiments, Menon and his team of researchers took a picture of the University of Utah's "U" logo as well as video of an animated stick figure, both displayed on an LED light board. An inexpensive, off-the-shelf camera sensor was connected to the side of a plexiglass window, but pointed into the window while the light board was positioned in front of the pane at a 90-degree angle from the front of the sensor. The resulting image from the camera sensor, with help from a computer processor running the algorithm, is a low-resolution picture but definitely recognizable. The method also can produce full-motion video as well as color images, Menon says. The process involves wrapping reflective tape around the edge of the window. Most of the light coming from the object in the picture passes through the glass, but just enough–about 1 percent–scatters through the window and into the camera sensor for the computer algorithm to decode the image. Applications for a lensless camera can be almost unlimited. Security cameras could be built into a home during construction by using the windows as lenses. It could be used in augmented-reality goggles to reduce their bulk. With current AR glasses, cameras have to be pointed at the user's eyes in order to track their positions, but with this technology they could be positioned on the sides of the lens to reduce size. A car windshield could have multiple cameras along the edges to capture more information. And the technology also could be used in retina or other biometric scanners, which typically have cameras pointed at the eye. "It's not a one-size-fits-all solution, but it opens up an interesting way to think about imaging systems," Menon says.